Relay games for kids provide a great way for groups of kids to work together to accomplish a goal. They can be used as a way to break the ice when children don't know each other well and can be a fun pastime for a number of occasions. It doesn't take much to put together fun and creative relay races for kids, so check out these ideas to get started! If you need a team-building relay race or a unique relay for a sports day, "Dribble, Pass, Shoot" is perfect. The game works best on a basketball court, but if you can't access one, you can use laundry baskets or some other large vessel for kids to shoot basketballs into. You'll need at least eight kids to participate in this relay that features soccer, basketball, and teamwork skills. Designate one end of the court as the starting side. Place one basketball and one soccer ball where you want each team to line up on the starting side. Do not set any team up directly in line with the basketball hoops. If you use small soccer goals, set one up at the other end of the court directly across from where you placed the balls. If you are using large nets, place one centered on each side of the basketball hoop. Separate the group into equal teams of at least 4 people. Each team lines up in two rows behind their balls at the starting line. The first two players choose one ball. One person starts by dribbling the ball for three steps then passes the ball to their partner. The basketball should be passed with either a bounce pass or chest pass. The soccer ball should be passed with the feet. Each pair moves across the court taking turns dribbling and passing the ball. When the teammates reach the other side of the court, one person takes a shot. Shoot the basketball in the hoop and the soccer ball in the goal. If they make it, they grab their ball and both teammates run back to their staring line. If the first person doesn't make it, the second person gets to take a shot from the same spot where the first person missed. They continue taking turns until one person makes the shot. When the first team reaches their starting line, the next pair of teammates chooses the other ball and repeats what the first pair did. After the last pair from the team returns to the staring line, the whole team sits down. If you only have four players, you can make each pair go twice or even have them switch partners for the second round. The team with all their players sitting at the starting line wins. This relay game for kids is played indoors on a gym floor and includes four teams. If you have smaller or larger group, you can remove or add bowling pins to accommodate more or fewer groups. Place one bowling pin in the center of your space. Set up four bowling pins in a large circle around the center pin, leaving about four to six feet between them and the center pin. Place a beanbag beside each outer pin. Have one person from each team stand beside each of the outer pins. When you give the signal, these participants run around the outside of the circle. When they get back to "their" bowling pin, each person throws his or her beanbag across the floor and attempts to knock the bowling pin in the center of the floor over. After throwing the beanbag, the person retrieves it and sets the pin back up if needed then places it beside his or her team's bowling pin. Then the next person on the team gets a turn until all the participants have had the chance to try beanbag bowling. Each player who knocks down the pin gets 1 point for their team. Tally each team's points at the end. The team with the most points wins. Kids of any age can try this challenging relay that can be played inside or outside. For the best results, provide boots or hip waders that are large enough to fit over kids' feet with their shoes still on. You could also substitute in any footwear that would make running difficult like toy Moon Shoes. Create a starting line with the tape or rope at one end of your play area. Create a finish line at the opposite end. Place a pair of boots where you want each team to line up at the starting line. Each team lines up behind their boots. After you give the starting signal, the first person puts on the boots and races down a set course and back. He or she must remove the boots before passing them to the next participant who puts them on and runs the race. The winning team is the one where all members have completed the course. 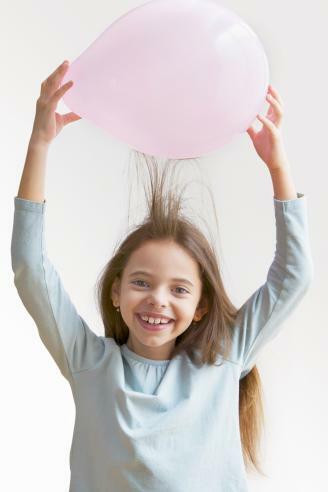 Incorporate a bit of science into your relay race when kids harness the power of static electricity. This relay race works best indoors on a carpeted surface, but can be played anywhere. Even preschoolers and kindergarteners can play this simple version of a classic balloon relay. Blow up all the balloons. Place one inflated balloon in each laundry basket for every player on that team. Place the baskets in a row at the start line. On "Go," the first player from each team grabs a balloon and runs to the mid-point line at the other end of the room. As they run, they must rub their balloon on their shirt or head the entire time to charge up the static electricity. When they reach the mid-point line, they can run back to the start line while still rubbing the balloon. When they reach their next teammate, they have to stick the balloon to their teammates back. The next teammate can then grab a new balloon and repeat what the first player did. The object of the race is for every teammate to end up with a balloon stuck to their back. If anyone's balloon comes off before their team is done, they have to run the race again and stick their own balloon to their back upon reaching the start line. The first team to have all players with a balloon stuck on their back wins. Older kids who are able to throw flying disks with some accuracy can participate in this outdoor game. You can play a similar game with younger kids using flatter flying disks or even plush balls. Separate the group into equal teams with an even number of players. Split each team in half. Half of the players are placed in a line at one end of the field while the other half of their team is placed in a line directly across from the first half at the opposite end of the field. Give one flying disk to the first person on each team. On "Go," the first player from each team throws the flying disk down to the first person in their team's line at the opposite end of the field. If their teammate catches the flying disk, the person who threw it goes to the end of the line. If their teammate does not catch it, the thrower retrieves it and tries again until it is caught. Game play continues like this until the last player throws the flying disk to the player who went first on the team. When the player catches it, the whole team sits down. The first team to have all players successfully throw the flying disk for a catch wins. This game is very simple to set up and play. Give each team a lemon and a pencil. The participants use the pencil to push the lemon through a racecourse and back to the beginning. Then the next person on the team takes a turn pushing the lemon through the course. Visualize a lane for each team. Use your tape or rope to create a winding course down each lane. It should have a starting line and go across the room then back to the starting line. Leave a lemon and pencil where you want each team to line up on the starting line. On "Go," the first player from each team picks up their pencil and uses it to push the lemon through their winding course and back. When the first player gets back to the staring line, they hand the pencil to the next player. Each player pushes their lemon through the course. The first team to get all players back to the starting line wins. Although there are teams in a standard Dodgeball game, each player is essentially on her own to throw, avoid, and catch balls. This team version allows players to use each other as a giant shield and coordinate their throws. Place all the dodgeballs in a line down the center of the playing area. Designate a side of the court for each team. On "Go," players can run up to grab balls from the center line. Only one individual person from the team can throw the ball at a time. After their throw they must stand behind a teammate, holding onto their waist with at least one hand at all times - they are now "linked." Once a player links up, they remain that way for the rest of the game unless they get out. If the front person on a link gets out, they go to the end of the linked line. If they get out a second time they sit out. If any other person from the link gets out, they sit out. When a ball is caught, one "out" person comes back into the game, but they can't join the team's link until they throw a ball. The team with the most players connected in a single link after there are no "loose" players left wins. Toddlers and preschoolers can play this easy game at home or daycare. Add a level of difficulty for older kids by having them search for particular words instead of images. Set up a row of chairs for each team, one behind the other. You'll need one chair for each player on the team. At the opposite end of the room, in line with the row of chairs, place a bin of picture books. Tape one image underneath each chair. For the sake of fairness, use the same images for each team only place them in different orders. Each player on a team starts the game sitting in their chair in the row with their teammates. The first player on each team reaches under their chair and takes the image down to their bin of books. When they find their image in a book, they show it to you then return the book to the bin. They can hold on to their image. When the first player returns to their chair, the next player can reach under their chair for their image. Once all players from a team have found their image and returned to their chair, their team is done. The team who finishes first wins. You can do this yummy relay with any food that requires multiple steps. 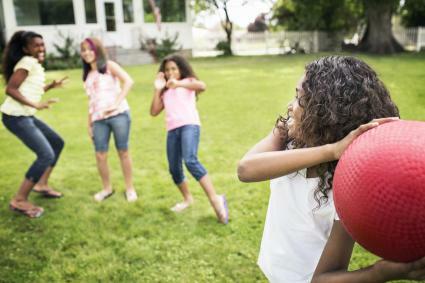 Although younger kids can participate, it's best for older kids and tweens. You can do this with one team as a non-competitive relay race or, if you have more prep space, you can have two or three teams play. Place all the ingredients separately on the prep table. Keep the team in a separate room from the prep table. The first player goes to the prep area, puts on a pair of gloves, and puts the pizza dough on the pan. Then they remove their gloves and go back to tag the next person. Play continues in this order: sauce on the crust, pepperoni on half, pepperoni on other half, cheese on half, cheese on other half. If you have an oven that is pre-heated, you can also add the steps of putting it in the oven, turning on the timer, removing it from the oven, and cutting it. Whether you use the cold pizza, or heated pizza, the whole team gets to eat their pizza as a treat at the end! 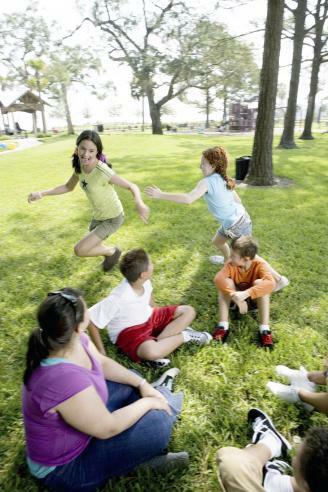 With a little imagination, you can turn almost any classic kids' game or activity into a group relay race. Turn a game of Simon Says into a fun relay when you split your group into equal teams. Assign each player a number so there is a Number One, Number Two, etc. on each team. Start with all Number One's playing a regular game of Simon Says where you call out actions. You can randomly call out directives to switch teammates by saying something like "Simon says switch with Number Four." If someone gets out, the next number on their team jumps into the game. The person that is out must sit out for the rest of the game unless their number is called back in by "Simon." The team with the last player standing in the game is the winner. 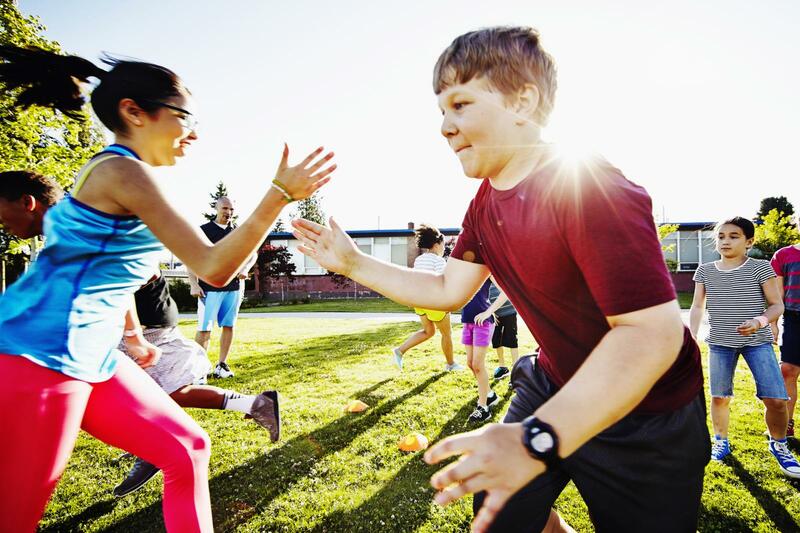 Separate your group into equal teams to play Freeze Tag or any other version of Tag. You'll also need to choose one person to be "It." Start with one player from each team running around trying to avoid getting tagged by "It." If a player gets tagged, one of their teammates joins the game and is the only person who can "unfreeze" them. Once "unfrozen," both players stay in the game. As more players from each team join the game, they can only "unfreeze" players from their own team. The team with the least players in the game at the end wins because it means their teammates got tagged the least! Think of this as a giant game of Duck, Duck, Goose! Separate your group into equal teams. Count off each team by ones. Have each team sit in their own circle in the playing area with each player holding up the number of fingers that represents their number. Go around all the circles saying "Duck" or "Relay" as you tap each child's head. When you say "Relay" also shout out the number that corresponds to the player you have touched. All children from all teams with that number must run around the outside of all the groups then head back to their original seat. Anyone who gets tagged by you is out. The last team with players left in the game wins. All relay races are run in a similar manner and follow the same basic rules. Make sure everyone understands how to play and that teams are evenly matched so kids can focus on having fun.